October 6, 2018. Thekchen Chöling, Dharamsala, HP, India – At the start of the final day of teachings for students from Taiwan, His Holiness the Dalai Lama announced that he would first perform preliminary rituals in preparation for the Avalokiteshvara permission he was going to give. Once he was ready, he explained that he had decided that the permission of Avalokiteshvara Who Liberates from the Lower Realms would be an auspicious conclusion to several days of teachings. Besides this he said he would also give the lay-person’s precepts and the bodhisattva vows. He added that, whereas Chandrakirti’s ‘Entering into the Middle Way’ had been an introduction to the teachings of the Buddha, this morning he would read Je Tsongkhapa’s ‘Three Principal Aspects of the Path’, which serves as a summary. “Aryadeva’s advice to overcome unwholesome deeds, to eliminate views of self and finally to eradicate all wrong views,” His Holiness observed, “refers to making progress on the path. After Buddhism was introduced to Tibet in the 7th and 8th centuries came a period of deep decline, a period when there were no longer any monks in Central Tibet. This was the context in which descendants of the Tibetan Emperors invited Atisha to Western Tibet. He composed the ‘Lamp for the Path’ and with Dromtönpa established the Kadam tradition that involved putting the whole teaching of the Buddha into practice within the framework of the three kinds of person. “Je Tsongkhapa summarized these teachings under the heading of the Three Principal Aspects of the Path, which refer to the determination to be free, the altruistic spirit of enlightenment and a correct view of emptiness. Tsongkhapa was born in Amdo and later moved to Central Tibet where he studied at the Kadampa monastery of Sangphu. “Initially he relied on his teacher Umapa Pawo Dorje as an intermediary in consulting Manjushri, but later experienced his own visions. On one occasion, in the course of a vision, Manjushri gave him a succinct explanation of emptiness. When Tsongkhapa told him he couldn’t understand it, Manjushri urged him to study further. “As a result of his study and practice he became a teacher with many disciples. When Manjushri advised him to retire to the life of a hermit to accomplish purification and collection of merit, some rebuked him for abandoning these students. Manjushri retorted that he was aware of what would be the most benefit. Tsongkhapa went into retreat at the Olkha Cholung Hermitage. “During a dream of Indian masters of the Prasangika Madhyamika School, Buddhapalita stepped forward and touched a copy of the commentary to Nagarjuna’s ‘Fundamental Wisdom’ that bears his name to Tsongkhapa’s head. Next day he was offered a copy of that book and read it. The Three Principal Aspects of the Path was composed in response to a a letter of request from Tsako Ngawang Drakpa, a close disciple Tsongkhapa had sent to teach in Eastern Tibet. The first line of homage to ‘the venerable lamas’ prompted His Holiness to remark that in his ‘Great Stages of the Path to Enlightenment’ Je Rinpoche clearly elucidates how to rely on a spiritual master. He wrote that those who wish to tame the minds of others should first tame themselves. They should uphold the three trainings in ethics, concentration and wisdom, should be knowledgeable, eloquent and compassionate. His Holiness added comments as he read the text. The first line of the first verse is a mark of humility. The subsequent lines refer to the three principles of the path. Verse two is an encouragement to make life meaningful. The third verse indicates how to cultivate a determination to be free, while verse five alludes to the measure of having done so. Verse six concerns the need to develop bodhichitta, while the following verses explain how to do so. His Holiness noted that by applying the meaning of verses seven and eight to yourself it can be used to strengthen the determination to be free. Although practices like love may counter some mental afflictions, verse nine clarifies that only an understanding of emptiness and dependent arising will do away with the fundamental ignorance that is the root of cyclic existence. In relation to verse ten, His Holiness reported that his debate partner Ngödrup Tsognyi emphasized the need for certainty about dependent arising both to understand the law of causality and to see all phenomena as lacking any objective existence. When you can do that, you have entered the path that pleases the Buddhas. Verses 11 and 12 deal with whether your analysis is complete. Things appear to have objective existence; they appear to exist of their own accord. However, once you have realized the Middle Way view even if they appear to be self-existent, you know that they do not actually exist in that way. In the final verse Tsongkhapa encourages his disciple to ‘depend on solitude and strong effort to quickly reach the final goal’. 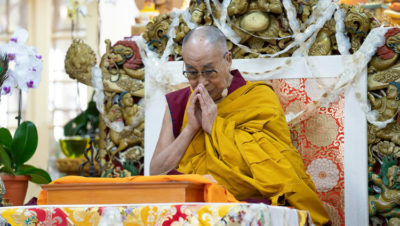 His Holiness urged his listeners to emulate that aspiration.